So you’ve decided to convert your old, outdated website to a blog using a platform such as WordPress, but you’re not sure what options to pick to ensure your blog pages rank high with the search engines. One of the easiest things you can do is customize your site’s “Permalink” format. The word “permalink” is short for the phrase “permanent link”. Once you make a blog entry (aka, post), it is given a name and that name gets turned into a permanent web address, or unique URL. Blogs are meant to be shared, quoted, linked-to and commented-on. It’s not surprising then, that once a blog entry is complete and posted, the URL or link needs to be permanent so when another website or blog links to it, it can be easily found on your site. If the link can’t be found the reader will get a 404 error saying the “page cannot be found”. Permalinks can be configured many different ways. 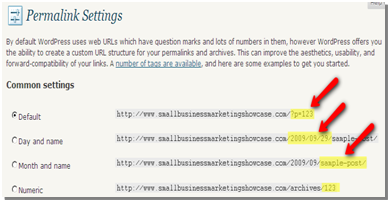 They can contain the author’s name, the date, blog category information and many other optional data elements. Now here’s the trick, search engines read blog entries like people do. So what’s most important to you, the date, the author’s name, or the content of the post? Hands down, the search engines like to find descriptive, keyword rich titles that accurately describe the contents of the post. Short, simple, clear and concise titling will rocket your posts to the top of the search engines and increase your blog traffic. Let’s look at how permalinks are changed in WordPress. First, log-in to your WordPress Admin site which should look something like www.yourblog.com/wp-admin. Of course, make sure you replace the words “yourblog” with your blog’s actual domain name. Next, look down the left side of the WordPress control panel. Near the bottom you’ll see the menu item “Settings”. Click on it. Depending on what options have already been installed into your particular WordPress setup, your next set of menu selections may look slightly different than mine. Click the “Permalinks” menu option. This is the area where we are going to make our changes. Notice that the default option contains some numbers at the end of the link. Using this method, each post is assigned a unique number in the database and can be easily and efficiently be found by the WordPress blogging platform. Unfortunately, just looking at the numbers, your readers have no idea what the post is about. Like I mentioned earlier, if YOU can’t read it, there’s a good chance that the search engines, and more importantly your readers, can’t read it either. So why does such an “ugly” naming convention get listed as the default? Because it is the most efficient for WordPress to archive, retrieve and deliver to the browser. Don’t forget that WordPress is just a fancy text database and as the number of visitors increase, it needs to be able to “serve” up all the requested pages very quickly. That’s a very important point, every option after the “Default” is slightly more difficult for WordPress manage, although usually more beneficial for the reader. The remaining 3 generic options allow some combination of date, post title, post category and custom numbering system. The two key takeaways here are: 1) there are lots of permanent address combinations available to build a Permalink that serves your needs (or suits your fancy); and 2) that WordPress prefers a number somewhere in the sequence, specifically, right after your domain address. In the examples below, it is some portion of the date. Okay, ready to make your posts standout with the search engines? First, select the Month and Name option (the third one down). Notice that the “Custom Structure” option box fills up with the Permalink variables needed to make Month and Name the link choice. Variables are enclosed in percent “%_%” signs and separated by slash “/” marks. Your custom field should look something like this: /%year%/%monthnum%/%postname%/. By clicking on the Month and Name option, we’ve saved ourselves some typing. Now put your cursor in the Custom Structure field and get rid of everything except the /%postname%/. Choice #1: Simply leave the Custom Structure as http://www.yourblog.com/%postname%/. Many popular blogs use this format and get great search results. Choice #1 and Choice #2 (below) offer two great benefits: First, the post’s title keywords show up early and clearly in the address line; and second, because the post name is right after the blog domain name, it appears to the search engine to be higher in the site directory structure and therefore more important. It is also fairly easy for the audience to figure out what the address line means since there isn’t a lot of extra information in the link (dates, categories, authors, etc.). Considerations: Leaving the extra slash “/” mark on the end of the post name is pretty standard for WordPress blogs; however to the untrained reader, it may look as if the link is a subdirectory or script rather than a general post. Choice #2: Delete the final slash and enter the letters “.html” (don’t forget the dot). Your permalink should now look like this – http://www.yourblog.com/%postname%.html. You can add any letters you want to the end of the post name, and WordPress will try and comply. Same as above, this format generates excellent search results. The name of the post is once again immediately after the blog domain name. For the search engine and the reader, this format has the added benefit of looking like a traditional webpage. It is also a handy format if you want to permanently archive your posts as html pages (for example, if you want to shut down your blog, but maintain the post history) rather than dynamically generating each page (which is what WordPress does, despite adding the letters “html”) on the fly when requested by the reader. This is the format the Small Business Marketing Showcase uses. Considerations: Leaving the slash “/” mark off the end of the post name may confuse veteran blog readers. Choice #3: Insert /%category% in front of post name variable. Your permalink should now look like this – http://www.yourblog.com/%category%/%postname%/. This permalink format is very popular. Adding the category name helps the site administrator and contributors stay organized, bringing a feeling of structure and context to each post. It also gives readers a peek into how you see your site’s information and invites them to explore the “category” folder for similar articles. This format generates decent search results depending on the relationship strength between the category, the post and the content. Considerations: The name of the post is now further away from the blog domain name. Additionally, at some point in the future, you may wish to change how posts are organized within categories (I know I’m always tweaking category names and where I want posts to appear) creating a challenge for the platform to find and forward old link addresses. Early on in this article I mentioned that WordPress strongly prefers that permalinks have numbers early in the address line. I then immediately disregarded that statement and gave you three search engine friendly solutions that didn’t have a single number among them. It is important that I warn you that the builders of the platform clearly state that there are potential risks when optimizing WordPress for readability and not for database efficiency. The second reason is that if you never perform well within organic search results in the first place, worrying about too many visitors slowing down your blog’s performance seems a bit premature. For more information on all the permalink variables available and to personally read the warning, visit the WordPress Permalink Help Page. Search Engine Optimization (SEO) is as much art as it is science. Working your way up the search results is a never ending effort with ranking algorithms constantly changing. As writers we look for that blend of clear, audience focused content while considering keyword density, strong titling and the overall organization of our websites. WordPress offers several SEO opportunities and permalinks are one of them. Determine whether you want to insert a number like the post id (%post_id%) or the date. Would you like to learn more about optimizing your WordPress website? Consider purchasing WordPress SEO Strategies by ThemeSage. This short eBook is only $17, gets right to the point and can help your site and company improve traffic in just a few minutes. Click the book image or the link above to read more about this great resource. Just reading through your articles on SEO tips for wordpress. Keep posting those tips and you have me as a reader. Thanks for having such a detailed post and making it easily understandable.